It's not very rational or scientific to make up an answer and then look for evidence that you guessed right. Try letting the evidence itself determine what your conclusion is. Possible "odd woman, out," eh? Now that you've decided dark-complectioned Stella Mae Jacob left her two colleagues somewhere else and supplanted somebody (Reed? Hicks? Dishong??) in the five-person Calvary Group. For purposes of cross referencing the people in this photo (Altgens-6) with those in the Zapruder film, let it be noted that we can see hard hat-wearing A. J. Millican in both, and that in the Z-film there seems to be a woman in a blue raincoat between Unger's and Roberdau's "Jane Berry" and "Maggie Brown," who can also be (barely) seen wearing a light-colored headscarf in Betzner-3 and/or Willis-5, just like my little "June" Dishong is wearing in full-frame Altgens-6. Fwiw, "June" seems to have been Dishong's nickname. Her true full name was Mrs. Inez Juanita Hart Dishong (Dishong's an old English surname), and she was born around 1909 in Minnesota. She was apparently married to Ralph E. Dishong and was living in Irving,Texas, at the time of the assassination. Thanks for sharing your reasons pointing to your alternate blue coat Dishong. I must say Dishong's family memories, per Roberdeau, and her own personal notes are compelling for me. But who knows, maybe someday a family member will come up with photos that will settle the matter. Anyway, thinking about your original posting I modeled for my own interest the witnesses from about the Stemmons's sign to Millican. Your “new” Dishong was rendered center frame in bright green for easy location. Views from Zapruder, Betzner, Altgens and Moorman approximate locations are shown with insets taken from Robin Unger's collection. Moorman does not give a clear image to decide if, or where, she is standing at that time. However, Gloria Calvery stands out in profile fairly easy to recognize :-). Excellent job, and a great aide in helping members and guests see, in Zapruder and Atgens-6 (and, hey, maybe even in Betzner-3) the rather short, headscarf-wearing woman I've been talking about. 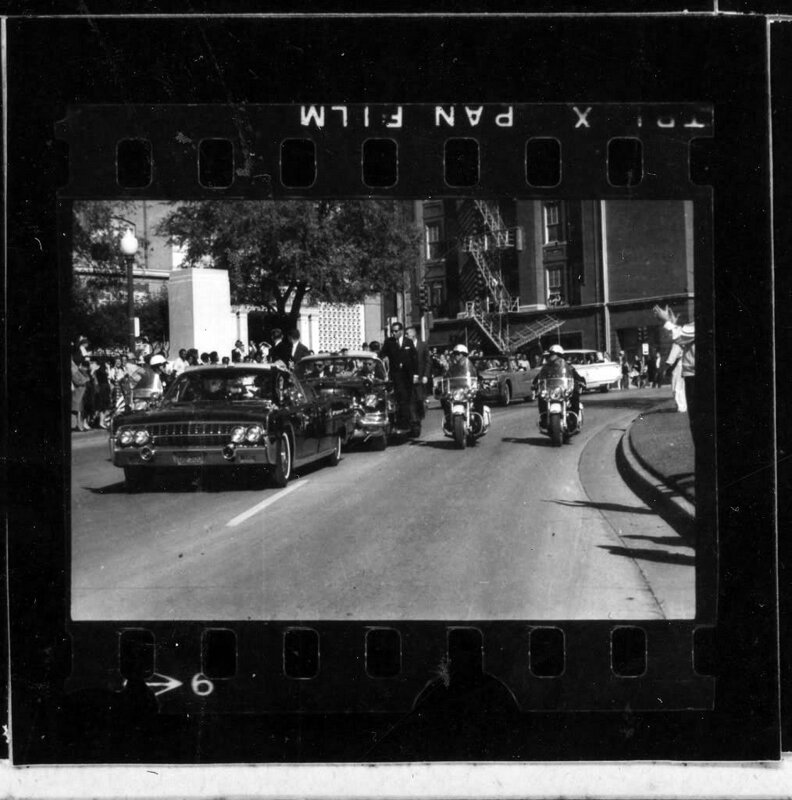 Regarding Dishong's poignant same-day, written-down memories of the assassination, I don't see how they conflict with my theory as to where she was standing during the motorcade. I can only speculate that Roberdeau might have consciously or unconsciously "guided" that relative to that particular (unknown, imho) woman in Betzner-3 because he knew from Westbrook's FBI statement that Dishong had watched the motorcade with Westbrook and Calvery, et al., and because he had already made up his mind (incorrectly, as we now know) exactly where Calvery was. PPS Thanks for including Moorman "3", James. I had totally forgotten about that photo. Mr Graves, are you referring to KarenWestbrookImage as "the woman in the blue dress between Lady All In White and Your Dishong"? In Betzner3, it appears to me that the SSA in the SS Limo is blocking two LadyImages, who I believe represent KaranHicks and CarolReed, with GloriaCalveryImage and KarenWestbrookImage visible. The LadyImage in question, who I had previously referred to as BlueCoatLadyImage, appears to be barely visible above the view blocking SSA's right shoulder. And, I believe that the attired in green mannequin represents the Image aka BlueCoatLady, that may or may not represent InezJuanitaDishong. 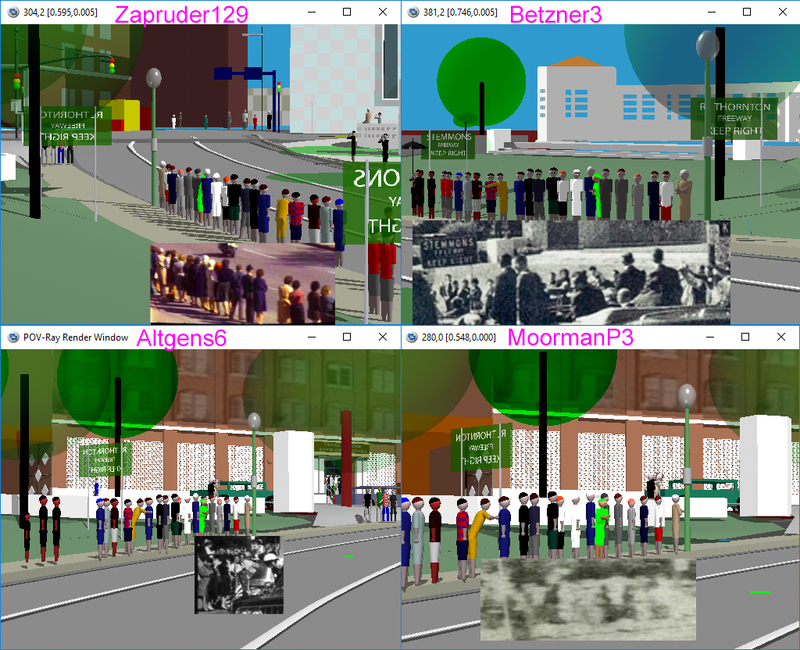 I'm talking about James' graphic reproduction of Betzner-3, above, in which he has a woman dressed in blue and wearing a white headscarf standing between "Woman All In White" and "My Dishong" (whom James has highlighted in green for us). I don't see that woman "in blue" and wearing a "white" headscarf in the Betzner-3 photograph, although I do see her in the Zapruder frame. I'm just surprised that, although I can see the tilted-down and light-colored-headscarf-covered head of shorty Dishong in Betzner-3, I can't seem to see the tall, darkly-dressed, light-colored-headscarf "Westbrook" next to her in Betzner-3 ... although James apparently can. PS I'm glad that James posted Zapruder frame # 129, above, because in it we can see a small part of shorty Dishong's light-colored headscarf, peeking at us from her position in front of and in between those other gals. All Monitors are Not created equal, but there IS a distinct Difference between the Colors BLUE & PURPLE. Referencing the Proper Color above would make the position you are proffering easier to follow while also spurring contributing opinions. Well, I see her in the supplied cropped Betzner3 Photo. Re-reading my post, if you can see NotTallLadyImage/aka BlueCoatLadyImage,(MrsDishong? ), said PersonImage is to KarenWestbrookImage's front-left. And, both LadyImages are visible over the SSA's right shoulder whose head appears to block KaranHicksImage and CarolReedImage in said cropped Betzner3 Photo. I do believe James sees it correctly. And, this Reply is not meant for debate, as it only confirms what I see represented by the Images as shown in Betzner3 Photo. About the white headscarf of my rendered Westbrook, my homemade mannequins can only show one color for either hair color or covering e.g. scarfs. For all four rendered POVs the models were completely unchanged. I meant to mention that but did not. Why we fail to see that white scarf in authentic Betzner3 is due to the scarf's position about half way behind the front of her head so we see her dark hair from his POV,. Follow her in early frames roughly 015-032. Don't blink, her head turn is quite rapid but gives us a good side view of her dark hair several inches forward of the front of the scarf. I was unaware of Dishong's name showing in any FBI report. The online FBI report (CE1381) at the History Matters web site is a searchable PDF, and she did not show up anywhere in that exhibit. I'm not sure her name was known in JFK lore until Roberdeau published his findings. Her family's recollection were her identifying herself in a LIFE magazine photo as being the fourth person from the Stemmons sign. That seems like a Zapruder frame. I don't know if Betzner3 or Bronson were published in LIFE. I interpret his words about her appearing in Betzner and Bronson as Don's commentary.